This years event was exceptional and we are grateful to all our Sponsors that made it happen” said Executive Producer Kim Kreiss. 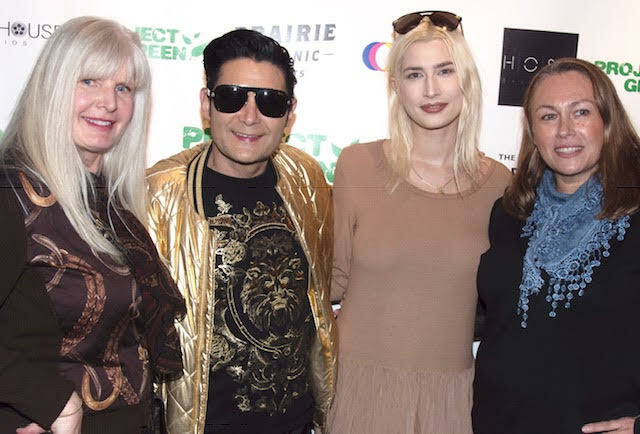 LOS ANGELES, CA, March 08, 2019 /24-7PressRelease/ — The weather may have been chilly outside at Sundance, but not if you were lucky enough to be invited to stay warm inside “The Retreat™️ hosting The Creative Coalition & Project Green” produced by Project Green founders Kim Kreiss & Patrycja Towns. Located right on Main Street, guests such as Oscar nominee producer Sean Reddick, Josh Gad, “Veeps” Tony Hale, Matthew Holcomb, Ben Shimmel, Tom Skerritt, Tim Daly, Jim Gaffigan, Corey Feldman, Kevin Smith, Terri J. Vaughn, Emmanuel Kelly, Nicole Alyse Nelson, Sam Daly, Reid Coz, Tyeler Reign, Richard Gunn, Brittany Portman, Alex Castillo, Joel Stanley and many more. The celebrity VIPs enjoyed imaginative jewelry of diamonds & precious metals which were all original designs by J.C. Jewelers. While enjoying their custom cocktails and refreshments provided by Prairie Organic Spirits, VIPs took time to participate in the silent charity auction by Host Galleries where generous Joel Stanley won the “Sundance Kid” oil on canvas by Ben Jeffreys, one of the UK’s leading contemporary artists. Guests did not leave empty handed. Each guest received VIP gifts of fabulous products such as tech-text-friendly gloves from Amanda Bradfords The League, an elite dating app. Keeping with the green theme, Young Living Essential Oils provided gift bags of organic make-up to the celebrities and VIP guests. Attending filmmakers met Terri J. Vaughn, Cas Beedles and Ernestine Johnson of Blackhouse Studios powered by Tulsa Real Estate Fund to discuss studio space at the new state-of-the-art campus located near Atlanta. Filmmakers also met with NFP: Insurance Brokerage a consulting an Entertainment Specialty Group that provides customized solutions for film producers. Young writer/producer Brittany Portman was onsite to promote her new comedy series “Hooked” with finance guests during the daily “Healthy Happy Hour” hosted by Muse Holliday while Celebrity Stylist and photographer Richie Arpino captured the red carpet excitement of celebrities at the 3-day event. DJ Serge provided the right musical atmosphere with a serene environment from Orchids from Amy’s Orchids.